#1: It wrongly connects the success of a message to revelation instead of fidelity. The aim of preaching is to faithfully preach the Bible (cf., 2 Tim. 4:2). Why? Because it already is the Word of God. 2 Tim. 3:16 reminds us that “all Scripture is breathed out by God.” The act of revelation is covered. Our job as preachers is not to get new revelation but to clearly explain, illustrate, and apply the revelation God has given to us in his Word – the pinnacle of which is the Person and Work of Jesus, the ultimate revelation of God (cf., 2 Cor. 4:6). When we talk about getting a “word from God” we make it sound like the win in sermon prep is getting some revelation from God instead of faithfully preaching the revelatory word he’s already given us! Our messages should be evaluated on their faithful exposition of the Scriptures instead of whether or not God spoke to us in a moment about what to say. Let’s use language that befits New Testament preachers than Old Testament prophets. We preach God’s words, not mediate them. #2: It unwittingly invalidates those who actually spent time preparing their messages. Including all the messages you’ve ever preached the “old fashioned” way. When I first heard that well-meaning lady refer to her message as a “word from the Lord” the first thing that came to mind was, “I wonder how all the other speakers feel about their messages now?” I am absolutely positive this genuinely sincere woman was in no way intentionally sabotaging the validity of the messages given before and after hers, but it didn’t matter. She had. If her message was a “word from the Lord” what were the other speakers’ messages? Nice ideas? Wonderful talks? Something other than that which carries the full weight of revelation? Talking like this unknowingly challenges, if not invalidates, other communicators (or Sunday School teachers, small group leaders, etc.) whose message prep took longer than an instantaneous jolt from the Almighty. It also may undermine the person’s own future sermons that aren’t preemptively stamped with the same “I gotta word” divine-revelation. Frankly, I tend to give more credence to those who spent days pouring over a text, doing the hard work of exegesis, building bridges from the world of the text to the world of their listeners, and prayerfully developing illustrations and applications so that God’s Word might be better known, digested, and obeyed, than the person who is essentially claiming to have privately received a prophetic word. #3: It fosters the myth that the Holy Spirit works only IN a moment and not OVER moments. The instantaneous “word from the Lord” frames the preaching event almost as simply an extension of a devotional experience. What did you learn from your “quiet time?” Well, just preach that. Here’s another option. How about setting apart some time to prepare a message that demands doing the hard work of homiletics? Don’t misunderstand. I’m not saying we shouldn’t seek the Spirit’s guidance as we prepare our messages. We should. I’m just not going to limit the Spirit’s work to some miraculous intervention in time (say, as I’m sitting in my airplane seat on the way to speak somewhere. No pressure by the way.) On the contrary, I pray the Spirit’s been working in, through, and around me throughout the days I’ve dedicated myself to the exhausting, focused, and time-intensive study for that message. Those successive, dedicated moments of preparation are just as much God’s territory as any one moment of inspiration. The apostle Peter reminds readers in 2 Pt. 2:19 that his personal experiences with Jesus only served to have “the prophetic word [i.e., the Scriptures] more fully confirmed.” In other words, it’s the Bible, not our personal experience, that is authoritative. Jesus confirms the same in Luke 24:27 when, instead of simply revealing himself to show his disciples he had been resurrected, he “interpreted to them in all the Scriptures the things concerning himself.” Any authority in preaching doesn’t rest in the preacher or his moments with God, the authority rests in the Bible he preaches and the Jesus exalted through it. Remember, you are going up to the pulpit, not coming down from the mountain. Saying you “got a word from God” for a specific message may give the wrong impression that the Bible in your hand isn’t enough. It might also minimize the regular preaching ministry of your local church. Listen, the truth is every time you step in the pulpit with a Bible you aim to preach Jesus from, you’ve got a word from the Lord. Pastors please, enough with the “I got a word from the Lord today” business. 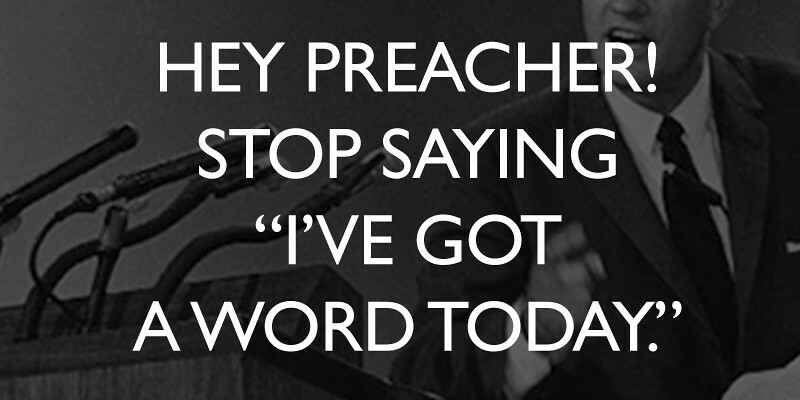 If you can’t say that every time you stand up to preach then don’t stand up to preach at all. I mean, what else would you give your congregants? Have confidence that, after doing the hard work of study, whatever day finds you behind the pulpit with an open Bible trying to explain, illustrate, and apply the glory of the gospel to your listeners, you already have the word you need.